Sloto’Cash is a popular online casino that gives customers many ways to super-size their bankrolls. Let’s have a look at some of the most exciting opportunities currently available – starting with the $31 no deposit bonus available to all new customers! 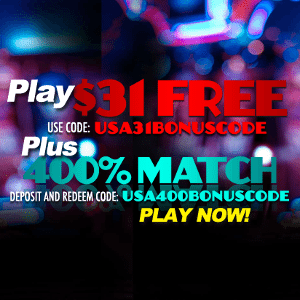 Get $31 free – no deposit required – when redeeming the Sloto Cash bonus code USA31BONUSCODE. Click here to visit Sloto Cash! 100% Bonus of $200 TABLE1MATCH Minimum $20 deposit. Sticky bonus. 25x Slots, 100x other. No Craps, Baccarat, Bingo, Pai-Gow Poker, Sic Bo, Poker. Roulette, and War allowed. Sloto’Cash Casino is so confident in what it does that it welcomes you to experience it firsthand without spending any of your own money. Simply register a valid account for the first time and redeem the bonus code USA31BONUSCODE. Sloto’Cash will then deposit $31 into your account, and you can use that money at the casino anyway you please. Put all $31 on a single turn of a roulette wheel or play 62 rounds of Cleopatra’s Gold slot machine at 50 cents a spin. If you play through the $31 and no winnings remain, you’re in the clear. You can either walk away or take advantage of the welcome bonus we’ll describe in the next section. If you did come out ahead, congratulations, and Sloto’Cash will let you cash out as much as $180. A wagering requirement does kick in at this point. You’ll have to play through your winnings 60 times before a withdrawal is allowed, and only wagers on slot machines and scratch cards contribute toward that requirement. If you choose to continue on at Sloto’Cash Casino and deposit some of your own money, you can boost your starting bankroll quite a bit by redeeming coupon code USA400BONUSCODE. To take advantage of this offer you’ll need to make the minimum deposit required by the cashier, which may depend on the payment type you choose and is often as low as $10. So, if you deposit $10, you get a $40 bonus and thus begin with a $50 bankroll. Perhaps the neatest aspect of this promotion is that there is no maximum. Deposit $100, $1K or even $10K and receive the 400-percent boost on all of it. There is also no limit on cashing out, which means that you could in theory cash out the entire bonus once you’ve met the rollover requirement. That requirement is 45 times the deposit plus the bonus. Also, although you can use your deposit and bonus however you choose, only slot, keno and scratch card bets contribute toward the playthrough. The bonus on the first deposit is a 200-percent match plus 100 free spins. The bonus on the second, third and fourth deposits is a 100-percent match and 50 free spins. The bonus on the final deposit is a 177-percent match plus 50 free spins. Each of these promotions require a $20 minimum deposit. The wagering requirement is 25 times the deposit plus the bonus on slots and keno only. Free spins from Sloto’Cash usually have the value of the particular slot machine set to the minimum coin size with all pay lines active. There is no additional rollover requirement for the free spins, but you still have to meet the main rollover requirement before making a withdrawal. The slot machine on which you can use your free spins will depend on which machine Sloto’Cash is showcasing. At the time of this review, all free spins were for Enchanted Garden II, a five-reel video slot machine by RTG. Sloto’Cash Casino also offers two deposit bonuses for table games, and you can use these whenever you please, including after taking advantage of the six other deposit bonuses described above. The first bonus requires coupon code TABLE1MATCH and matches your deposit by 100 percent up to $500. The second bonus requires promo code TABLE2MATCH and matches your deposit by 50 percent up to $500. This promotion requires a $20 minimum deposit. TABLE1MATCH has a 25-times playthrough requirement, but it’s only 22 times for TABLE2MATCH. Unlike most bonuses at Sloto’Cash, these do allow you to meet your rollover requirement on table games; however, there are restrictions, which we’ll discuss more in the final section. As a Sloto’Cash member, you’re automatically enrolled in the casino’s reward program, if you remain active, you’ll eventually get an invite to the VIP Club, which ups the rewards. Starting out, you’ll receive comp points for each $1 you wager. The number of points you receive will depend on the game. Slot machines award more points than baccarat, for instance. Comp points convert into bonus money at the rate of 100 to $1. This bonus cash doesn’t have a rollover requirement but must be played through at least once. Comp points never expire as long as your account remains active. Some players prefer not to deal with wagering requirements, and Sloto’Cash Casino offers these members a cash back option. Next time you make a deposit, simply contact live chat, and the CSR will set it up so that you get an instant 25-percent cash back. You do have to play through the entire amount 10 times, which is a requirement of a sort, but it’s necessary to avoid exploiters, and every dollar you wager counts whether you’re playing blackjack or whatever. The standard wagering requirement on bonuses is 25 times the deposit plus the bonus. If you zero out your account, the requirements for the current bonus expire. Most bonuses require wagers on slot machines, scratch cards and sometimes keno and similar games to meet the requirement. In cases where table games are allowed, supported games contribute 25 cents for each dollar wagered. Unsupported games contribute nothing and include baccarat, bingo, craps, sic bo, war, all poker games and all games and slot machines with a progressive jackpot. Get your $31 no deposit bonus from Sloto Cash today! Find more no deposit bonuses and other casino reviews at CasinoSitesUSA.